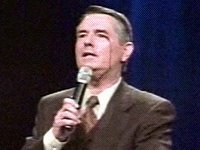 A couple of weeks back Pastor Billy Joe Daugherty of Tulsa, Oklahoma, was punched while leading a prayer time near the end of his church service. Watch the video below and you'll get the whole story. It is a great testimony of forgiveness in action, forgiveness 'under the microscope' if you will. Living in a peace bubble is another way to describe Billy Joe's attitude. What would you have done if you were in Billy Joe's shoes? Don't let evil get the best of you, but conquer evil by doing good. Defend myself! Sure, I would forgive him, after he's on the ground unconscious. I don't believe on being a punching bag just because I'm Christian. Thanks Mike for your response. A question for you is what does the 'dove love three times over' phrase you use in your email, (perfect love I presume), mean in a practical sense?